Lilac bush sizes range from short shrubs to tall "small tree" varieties. Among the many species and cultivars of the lilac bush, differing heights allow you to choose and utilize lilacs in your home garden according to your particular needs. From a low-growing 4 feet to a tall 25 feet, familiarize yourself with size categories, including varying spreads, when choosing a lilac for your garden. Lilac bush sizes depend on species and then cultivars within that species. Palabin lilacs (Syringa meyeri) are slow-growing bushes with a round shape, dense foliage and purple-violet flowers. Chinese lilacs (Syringa chinensis) are spreading shrubs with arched branches and fragrant purple/lilac flowers. Manchurian lilacs (Syringa patula) originate in Korea and display dense foliage growth and lilac/purple blossoms. Japanese tree lilacs (Syringa reticulata) are more tree-like and display white blooms. Chinese lilac trees (Syringa pekinensis) are also considered trees rather than shrubs and produce cream-hued flowers. Common or French lilacs (Syringa vulgaris) are the most widely planted lilac bushes, with leaves in the shape of a heart and a variety of colors, from white to purple. The palibin lilac is a smaller lilac bush variety, reaching a mature height and spread of 4 to 8 feet, though the spread may surpass the height. 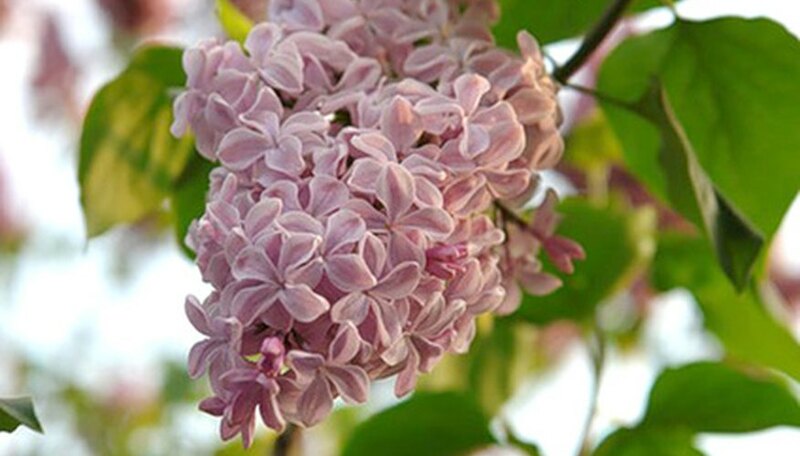 Manchurian lilac bushes, as well, are small, reaching a height of 5 to 8 feet and a width of 4 to 5 feet, according to the University of New Hampshire Cooperative Extension. Smaller lilac bushes are well suited for use as ground cover in the garden. Medium lilac bushes include the Chinese lilac bush, which grows to a height of 8 to 15 feet, with a spreading habit and fragrant flowers. The common lilac or French lilac has a variable height, depending upon variety; with extremely aromatic flowers, this shrub reaches a height of 8 to 20 feet, with a width of 6 to 12 feet. Common lilacs have an extensive array of cultivar options to suit your garden's size needs, according to the University of Illinois Extension HortAnswers. Medium shrubs are widely planted for use as hedges. Tall lilac bushes are also referred to as "small trees" instead of shrubs. These taller varieties include Japanese tree lilacs, which grow to a height of 25 feet and a width of 20 feet; this bush is resistant to both borer pests and scale diseases. Chinese lilac trees are also tall, reaching a height of approximately 15 to 20 feet, with a spread of 18 feet. These lilacs are well-suited for use as solitary trees or shaped, large shrubs suitable as screens. For proper growth of lilac bushes, follow appropriate care requirements. Plants only reach their full height and width when kept vigorous. Lilac bushes thrive in full sun and prefer moist, well-drained soil high in organic content, according to the University of New Hampshire Cooperative Extension. Along with stunted growth, improper maintenance may result in poor flowering as well as greater susceptibility to problems like lilac borer pests or scale disease.